Image galleries on WordPress.com are a great way to share your pictures with your friends, family, and your followers. An image gallery will display a set of small images attached to a particular post or page. Readers can click on any image to launch a full-size carousel that allows them to scroll through the entire gallery one image at a time. With the slideshow option, images will automatically move from one to the next after a few seconds. You have several choices for how a gallery will be displayed in your post: a thumbnail grid layout, a tiled mosaic-style layout, or in a slideshow. All sites default to the thumbnail grid style. You can also style each gallery individually. To switch to tiled layouts from the default, head over to Settings → Media in your blog’s dashboard, scroll down to “Image Gallery Carousel,” and select the box next to “Display all your gallery pictures in a cool mosaic.” Note that choosing this option makes this layout the default for all your blog’s galleries, including those you’ve previously inserted. 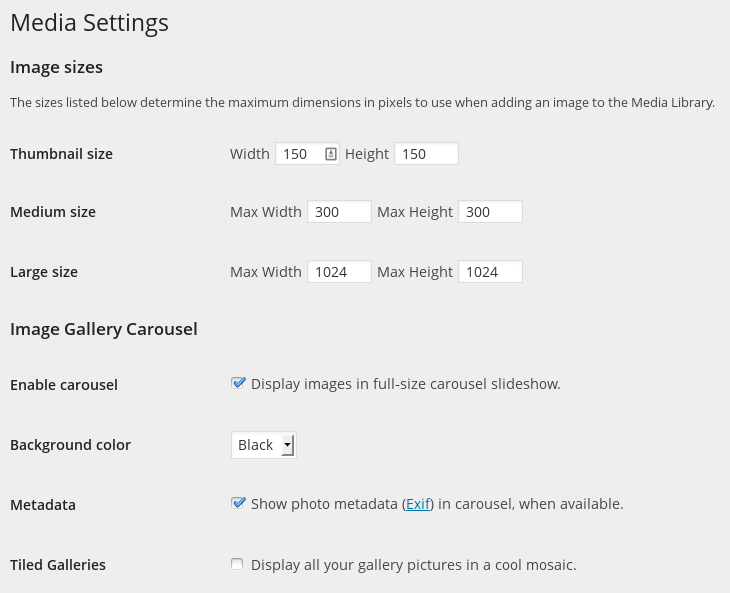 When clicked, gallery images are displayed in a full-size carousel view, which you can customize from the Image Galleries Carousel section of the Media Settings. Open a post or page for editing. If it is a new post or page, make sure to add a title and save it at least once before trying to insert a gallery or slideshow. Click the Insert Content button and select the Add Media button. The numbers that appear on the images as you click indicate the order in which they’ll appear in the gallery. When you’ve selected all of the images you’d like, click Continue at the bottom right to proceed to the gallery settings. Link to: Does not apply to slideshows. Columns: The number of columns of thumbnails to display. This may be affected by your choice of theme, so be sure and test a bit with your current theme. This option does not apply to slideshows. Random Order: Check this box to randomize the order of images in your gallery or slideshow. That means the order will change randomly every time the page is loaded. Layout: Specify the type of gallery here. The options are a default gallery of thumbnail images, a gallery with rectangular tiles, a gallery with square tiles, a gallery with circular tiles, or a slideshow. When you’ve finished editing your gallery, click Insert. Note: If you select Individual Images, this will not create a gallery, but instead it will add the images to the page as though you had added them one by one. It isn’t possible to convert from Individual Images into a gallery style. Open a post or page with a gallery for editing and make sure that you are in the Visualediting mode. Click on the gallery and then click the Edit icon that appears. Adjust the Gallery Settings if necessary. Make sure to click the Update button to save your settings. This shortcode will display the images attached to the post or page. Note that after you’ve published or updated a post or page including the gallery shortcode, the Visual editor will no longer display the shortcode itself. To edit an already-entered shortcode, simply switch to the Text editor, where you will be able to see and edit the code. You can also pass other settings with the gallery shortcode. Note: To get an attachment ID for an image, go to your Media Library and click on the title of the image you want. You can find the ID in the URL (the number after post=). You can follow almost the same steps for getting a post ID. Instead of going to your Media Library though, go to your Posts screen and then click on the title of the post you need. You can also manage gallery styles individually. To do so, go to Settings → Media. Under the section Image Gallery Carousel, uncheck the box Display all your gallery pictures in a cool mosaic and click Save, to keep the default thumbnail grid layout across your site. When you want to include a gallery in a post, insert it as usual and then simply switch over to the Text tab in the post editor and add the code for the gallery style you want to use (see Gallery Shortcodes). If you do not add a style, it will default to the thumbnail grid layout.